The PowerPro combines a full set of measurement functions with high levels of accuracy and rugged dependability making it suitable for even the most demanding applications. Designed for professionals, this tough IP67 sealed unit is nevertheless extremely easy to use. To see how easy it is to use please click below to view our Power Pro online demonstration. 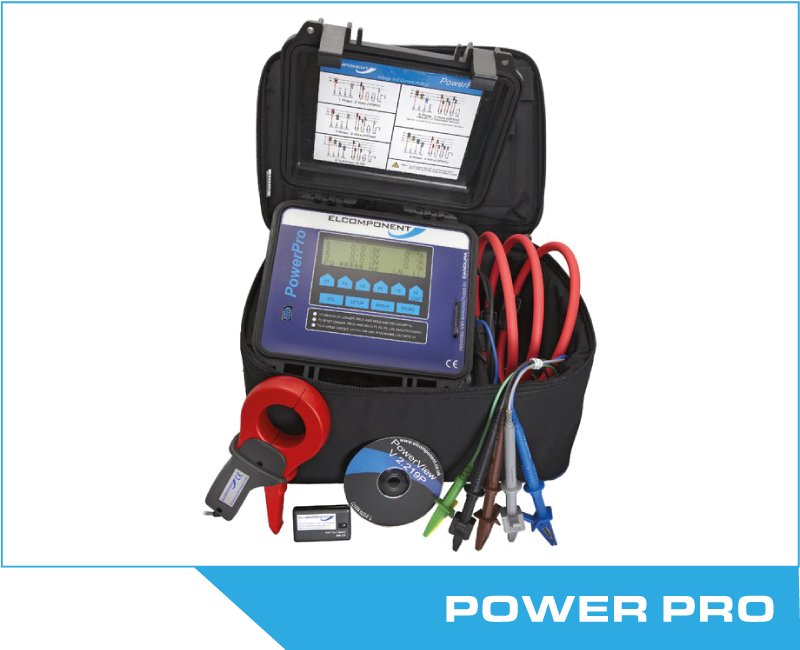 The PowerPro combines detailed power & power quality analysis plus flicker and transient sampling, it measures and records voltage, current, power, THD,waveforms, Flicker (IEC 868, IEC 61000-4-15 PST & PLT) and transient occurrences. The on-board graphic display offers waveform and FFT bar charts in real-time, along with other data and menu functions. Data is stored to a standard format plug-in 32MB Flash Card for easy download and replacement in the field. The instrument is compatible with any CT/VT combination and is suitable for phase to phase voltages of up to 1000V. It may be ordered with either 'traditional' iron cored CTs, or the latest flex type devices. Flex CT kits plug straight into the PowerPro using a single MIL-spec connector ensuring correct hook-up, and providing an integral power supply to the CTs. This means surveys are not limited by flex CT battery life. Ideal for measuring motor start-up or transformer energisation this feature provides a detailed waveform snapshot as well as an RMS profile of both current and voltage under user-defined current inrush conditions. ENERGY PRO from Elcomponent on Vimeo.